When Windsor Altman was born more than two years ago, a Pediatrix newborn hearing screener tested the little girl’s hearing on her first day of life. Windsor did not pass the screen. Because Pediatrix performs the newborn hearing screen as soon as possible after birth, there was time for her to be rescreened at two days old before discharge from the hospital. Windsor did not pass the screen. Three weeks later, Windsor’s parents, Erica Lucci and Chris Altman, brought their daughter back to the hospital for a final screen as an outpatient. 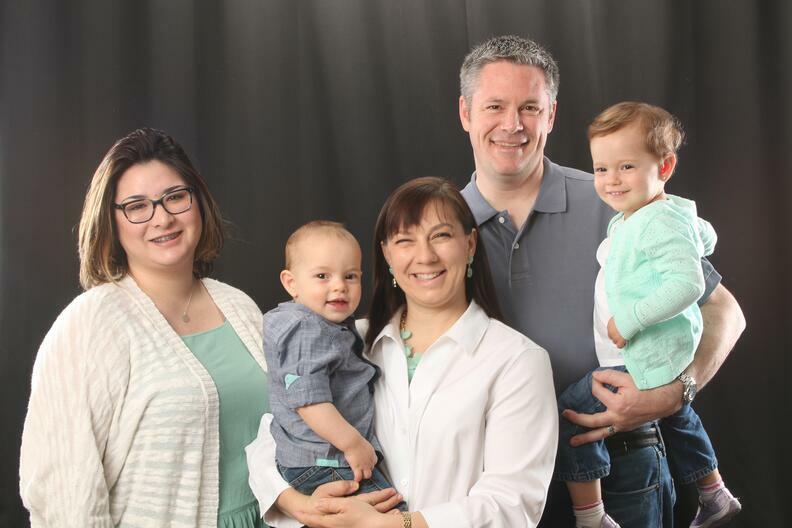 Before the outpatient rescreen even occurred, a family history of hearing loss led Erica to believe Windsor would need diagnostic testing and perhaps hearing loss intervention. Erica’s niece, Lizzie, was 2 years old when Windsor was born, and Lizzie had hearing loss. “I knew Lizzie was doing OK… that a good life was possible,” said Erica. Even with an instinct feeling that Windsor would not pass the third screen, Erica was unprepared for the result. “Fear, fear, fear,” said Erica, was what she remembered after Windsor did not pass the last screen. “The screener was very nice, but I was so angry and scared. I wondered what I had done wrong during the pregnancy after working so hard to create a healthy baby. There was so much guilt and fear of the unknown,” she said. When Windsor did not pass the third screen, she was referred to an audiologist for further evaluation. The Pediatrix NBHSP strives to educate all parents about the importance of early follow up for babies at risk for hearing loss, particularly diagnosis before 3 months of age and intervention before 6 months of age. The Early Hearing Detection and Intervention (EHDI) system is in place to assist parents through this process. Pediatrix NBHSP helped facilitate Windsor’s follow-up diagnostic testing appointment and connected Erica with state resources in Arizona. After further investigation by an audiologist, Windsor’s diagnosis was mild-to-moderate bilateral sensorineural hearing loss. Windsor could detect sounds in both of her ears, but the sounds were not clear enough to be processed by the brain. EHDI protocol encourages intervention by 6 months of age. 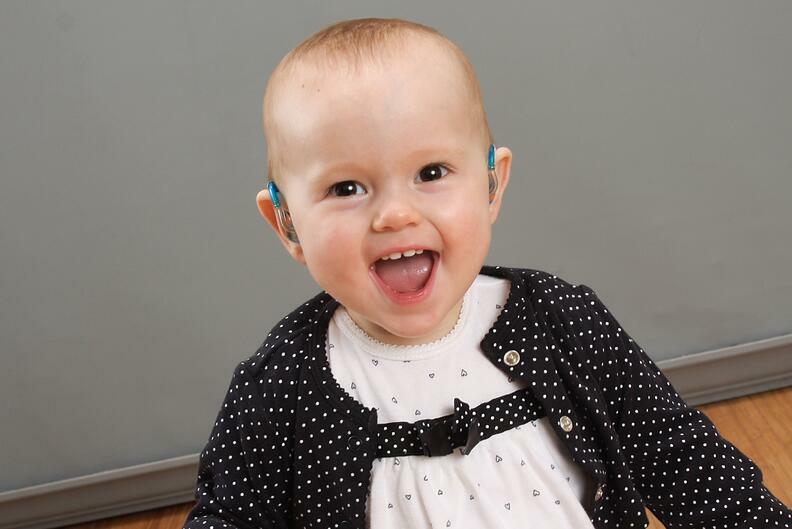 Windsor was fitted for her hearing aids before 3 months of age. “It was an incredibly stressful time,” said Erica. “I remember so many appointment with specialists. Our family was coached on how to help Windsor on her language development. We were told that a child with hearing loss should hear things three times more often than a child with normal hearing. We even took Windsor out of daycare and hired a private nanny to encourage that one-on-one verbal interaction,” said Erica. “The single most important step any family can take is to create a language-rich environment,” said Gerstenberger. “Talking and interaction are critical to a child’s development. The ears are the doorway to the brain, and most brain development in terms of oral language learning happens during the first 3 years of life. A language-rich environment applies for children with and without hearing loss. Ensuring all children’s brains have access to sound is the goal of newborn hearing screening,” she said. Now almost three years old, Windsor knows hundreds of words. “Her skills are off the charts,” said Erica. “She is speaking in sentences. She sings songs and even makes up her own songs, which is amazing. We don’t feel like her hearing loss will hold her back at all,” said Erica. “When Windsor was around 1 year old, she stopped taking out her hearing aids; now she asks for them. She knows what they are and what they do for her. We talk about them, and how some people wear hearing aids and some people don’t,” she said. While Windsor’s hearing aids are an important tool, the family wanted Windsor to have several ways to speak, so that she is never limited. “When she took swimming lessons, she didn’t wear her hearing aids, but she reads lips,” said Erica. “We just told the instructor to be sure to face Windsor and use hand signals when possible.” Windsor has also learned sign language. “We want her to feel like she is part of the deaf community and part of the hearing community,” said Erica. The entire family is learning to sign, including Windsor’s baby brother Emerson, 1, and adopted big sister, Sabrina, 19. The Pediatrix Newborn Hearing Screen team will be exhibiting at 2017 AWHONN Convention, a premier event for obstetric, neonatal and women’s health nurses, June 24-28, in New Orleans. Stop by Booth 238 to learn more about our newborn hearing screen program and other comprehensive, innovative solutions.